Celebrate the End of School or your child's Graduation with an awesome and unique candy party favor. This graduation gum head will be the life of the party and add a little bit of fun and sweetness to the end of school. I am feeling a bit overwhelmed today. School gets out in under three weeks and summer will be here. Yea, for that! But that also means that The Perfectionist will be graduating two weeks from last Saturday. Yikes. Where did the time go? You would think I'd be ready for this after dealing with The Drama Queen's graduation only a year ago, but I'm not. I'm not ready at all. But it's time to put my Party Enthusiast cape on and get to planning a graduation and end of school party. And for those of you that are part of my Email party list, I know you're waiting for me to get my rear in gear and send out this month's free printable. So today, I am. 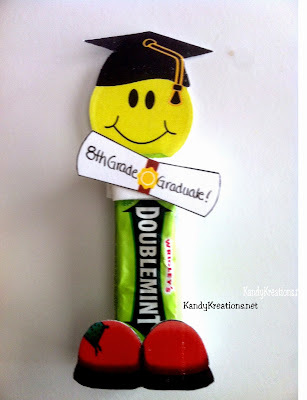 And I'm giving you something awesome and unique as an End of the School year treat or Graduation Party favor. 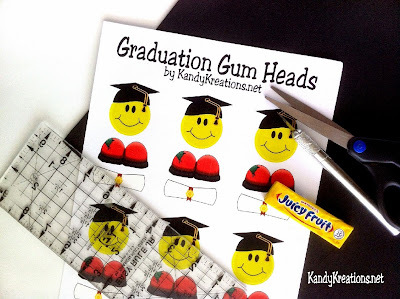 No matter what grade your kids will be graduating from, they would love to receive these fun candy party favors for the last day of school or graduation class party. 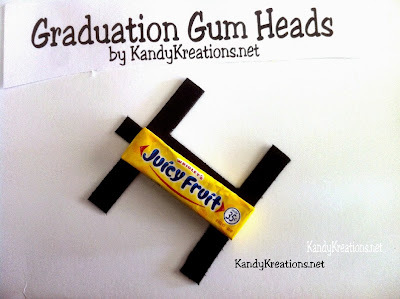 And although they look a little tricky, they are super easy to make! Start by grabbing the Graduation Gum Head printable from our shop here. Your printable will be available right away and you can download and print the file onto card stock. 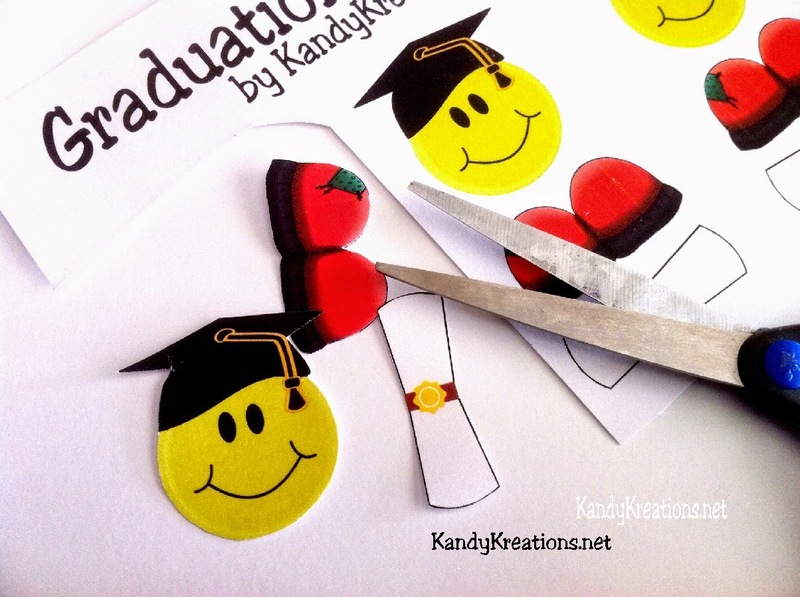 Use your scissors to cut out the smiley face graduation head, the shoes, and the graduation diploma from the printable. 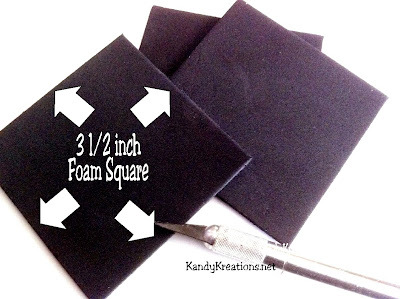 Cut your foam into 3 1/2 inch squares using your ruler and x-acto knife. Use your scissors and the enclosed cutting directions to cut your fun foam down to hold your gum candy. Add your 5 piece of gum package to the center of the fun foam. 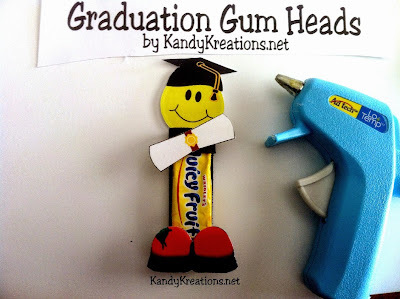 Use your glue gun to glue the fun foam together and add your cut graduation printable pieces. 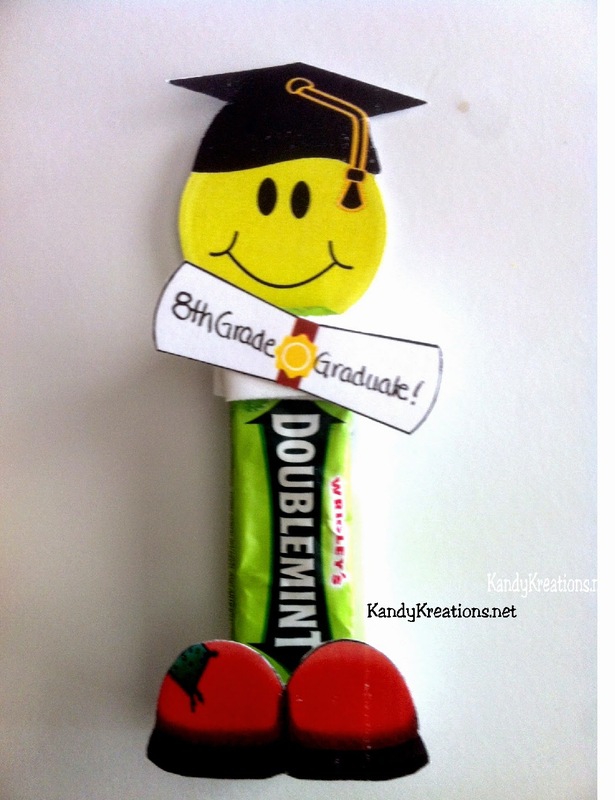 If you want you can add a sentiment to the graduation diploma saying "Congratulations! ", "Class of 2015", "Kindergarten Graduate", "2nd Grad Graduation", "You Did It!" or anything fun. 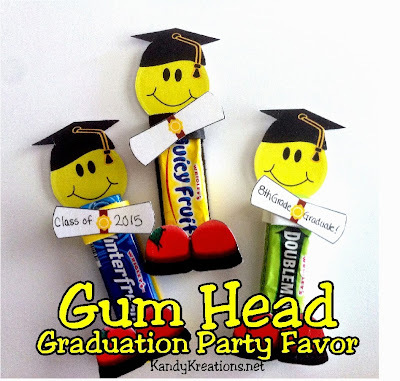 If you want to have this AWESOME candy Graduation party favor for your own class party or End of School party, go ahead and grab your printable today. I'm betting my party favors that you'll be glad you did!